At risk of sounding like a broken record, Crook County residents should be commended for their generosity in the face of adversity or needs. But perhaps repeating it each time the community comes through for causes is warranted and not unnecessarily repetitive. Consider the number of times in a single calendar year that people have donated thousands. Fundraisers for injured community members or families saddled with outrageous medical costs draw a crowd and pull in big money, and Hospice Auction donations have reached six figures for several Christmas seasons in a row. The most recent example may not involve as much money as the established holiday event, but the community response was heartwarming and outstanding all the same. As most people in the community know, the Wildland Firefighters Monument was inexplicably and despicably vandalized earlier this month. 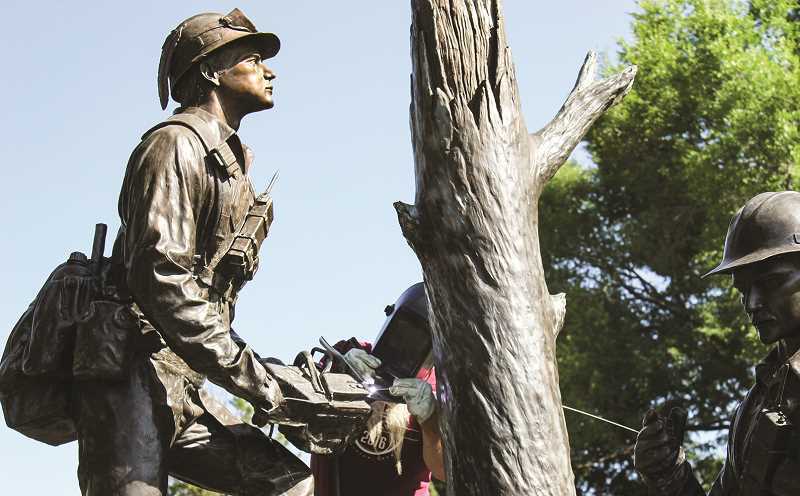 A chainsaw blade and handheld radio cord were broken off of the bronze statue that honors nine Prineville Hot Shots that lost their lives in the 1994 Storm King Mountain Fire. Locals vacillated between confusion, sadness and anger when they found out about the senseless destruction. Thankfully, a couple employees from Oregon Department of Forestry provided residents an avenue to donate to repair the monument. In true Crook County fashion, the donations poured in and it took less than a week to raise the $15,000 targeted to make the repairs. Many gave $100 of their hard-earned cash. A couple people pledged $1,000. Impressive generosity when one considers that this need for money came out of the blue and was not part of a planned and advertised event that people can prepare and save for. Money in hand, Crook County Parks and Recreation District staff took the reins and found a bronze artist out of Enterprise to fix the statue. He showed up this past Friday and before the weekend was over, the monument was repaired. Had that been the extent of the work, it would be enough to make people happy. But the story doesn't end there. Enough money is left over to repair lighting to the pathway at the monument — another piece of the memorial previously damaged by vandals. And, hopefully discouraging further destruction of the monument in future years, the donations will fund the addition of bollards and a decorative chain around the statue and the installation of security cameras at the site. The same old Crook County once again donates thousands to help a cause. And here we are again trumpeting the generosity of a small community that takes care of its own people and landmarks. Forgive us if it sounds like a broken record — but in this case, it's still one worth playing.